With its business-friendly climate and exceptional quality of life, Saint Louis is a perfect fit for businesses and families. The region offers all of the big city amenities as the country’s 19th largest metro area, but with the convenience and affordability of a smaller community. Home to a number of the nation’s largest businesses and a wealth of cultural attractions and entertainment options to match, you’ll find Saint Louis is an ideal place to live and work. The Saint Louis region offers a high degree of stability due to its greatly diversified economy, and has benefitted from being one of the nation's top 10 most cost-competitive places to do business. Saint Louis has historically been a leader in traditional industries such as advanced manufacturing, transportation and distribution, defense, and agriculture, but thanks to a well-established and educated work force the region is now at the forefront of innovative and exciting frontiers in plant and medical sciences, information technology, and other cutting-edge technologies. Additionally, the financial industry has invested in Saint Louis, making it the third largest concentration of securities advisors in the U.S.
Saint Louis isn’t all business. It’s also a field where fans cheer on professional baseball, football and hockey teams. 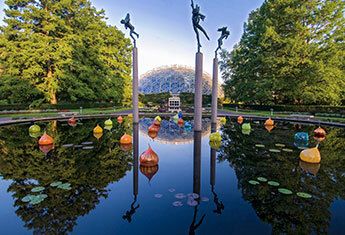 It’s a place of beauty to admire one of the top three botanical gardens in the world at Missouri Botanical Gardens or stroll through Forest Park, one of the largest urban parks in the U.S. and home to the Saint Louis Zoo, the Saint Louis Science Center and more. It’s a canvas where the St. Louis Art Museum showcases one of the country’s leading comprehensive art collections. It’s a stage for the prestigious Saint Louis Symphony Orchestra or a show at the historic Fox Theatre. It’s a plate to sample award-winning meals or homegrown delicacies like toasted ravioli. But most of all, it’s a community where Midwestern culture and global influences intersect. When you do business in Saint Louis, you’re in good company. Home to 18 Fortune 1000 headquarters, of which 9 are Fortune 500, some of the country’s largest and most successful companies are based in the Saint Louis region. Express Scripts is a pharmacy benefit management organization. They are ranked 20th on Forbes Fortune 500, with a 2013 revenue of $104.62 billion. Reinsurance Group of America is an international global life and health reinsurance company. They are ranked at 274th on Forbes Fortune 500, with revenues of $10.30 billion. Graybar Electric is a wholesale distributor of electrical, telecommunication and data networking products. They are ranked at 449th on Forbes Fortune 500 with revenues of $5.70 billion. Emerson Electric is a power (electric) equipment manufacturer. They are ranked 121st on Forbes Fortune 500, with a global presence in more than 150 countries and 2013 revenues of over $24 billion. Peabody Energy is the largest private-sector coal company in the world. They are ranked 365th on Forbes Fortune 500, with revenues of $7.01 billion. Monsanto is a multinational, agricultural biotechnology corporation. They are ranked 197th on Forbes Fortune 500, with breakthrough achievements in the agriculture industry revenues of $14.86 billion. Ameren is a holding company for several energy companies. They are ranked 379th on Forbes Fortune 500 with revenues of $6.87 billion. Centene is a multi-line healthcare management company. They are ranked 251st on Forbes Fortune 500, with services to government healthcare and revenues of $11.13 billion. Jones Financial is an investment services company for individual investors and small-business-owners. They are ranked 444th on Forbes Fortune 500 with revenues of $5.72 billion. Energizer Holdings is a manufacturer of batteries and personal care products. They are ranked 549th on Forbes Fortune 1000 with revenues of $4.47 billion. Olin is a major manufacturer of ammunition, chlorine and sodium hydroxide. They are ranked 832nd on Forbes Fortune 1000 with revenues of $2.52 billion. SunEdison is a global solar energy company. They are ranked 967 on the Forbes Fortune 1000 list, with revenues of $2 billion. Arch Coal mines, processes and markets coal in the USA. They are ranked 695th on Forbes Fortune 1000 with revenues of $3.23 billion. Panera Bread is a large chain of bakery-café quick and casual restaurants in the USA. They are ranked 867th on Forbes Fortune 1000 list with revenues of $2.38 billion. Sigma-Aldrich is a chemical and biochemical life sciences manufacturer. They are ranked 784th on Forbes Fortune 1000 with revenues of $2.62 billion. Belden is a manufacturer of signal transmission solutions. They are ranked 954th on Forbes Fortune 1000 list with revenues of $2.07 billion. Brown Shoe Company owns a variety of footwear brands in the USA and Canada. They are ranked 826th on Forbes Fortune 1000 with revenues of $2.54 billion. Stifel Financial is a full-service brokerage and investment banking firm. They are ranked 962 on the Forbes Fortune 1000 list, with revenues of $1.195 billion. Saint Louis makes dollars and sense for businesses. Saint Louis has a long history leading traditional industries such as advanced manufacturing, transportation and distribution, and defense. Additionally, with the well-established and educated work force found in the region, Saint Louis is at the forefront of information technology, plant and medical science, and financial service industries. Nearly 400 plant and life science enterprises and upwards of 15,000 employees call the St. Louis region home. St. Louis is home to Boeing’s Defense, Space and Security unit, the company’s largest subsidiary and the world’s third largest defense contractor with 15,000 local employees. There are over 40,000 computer and mathematical workers in Greater St. Louis, 26% higher than national averages. 84,000 St. Louisans – over 7% of the region's payroll – work in the financial activities sector at banks, investment firms, insurance companies, or in real estate. St. Louis is within 500 miles of one-third of the U.S. population and within 1,500 miles of 90 percent of the North American population and gross domestic product. For big city life with small community advantages, Saint Louis is just the place. Explore the region where the amenities of a big city mix with the charm of Midwestern culture. The result is a community filled with entertainment, attractions and industries that have garnered global acclaim. The "Gateway to the West" has the central location and transportation infrastructure that make it ideal for handling multimodal logistics. A distribution hub to numerous companies, the city connects to the world via two major rivers, four U.S. interstate highways, and the third-largest rail commerce center in the United States – with access to six Class I railroads. For a city with so many athletic, cultural and academic amenities, the cost of living is surprisingly low, translating into more home ownership and increased disposable income. It's also a competitive place do to business considering favorable labor, tax, real estate and utility costs. These factors have helped St. Louis earn its rank among the top seven metro areas that feature five or more Fortune 500 headquarters. A larger than average workforce of mathematical and computer professionals in Greater St. Louis and low cost office and lab space have helped make Saint Louis a hot spot for startups, particularly in the information technology and life sciences fields. Saint Louis is also home to T-REX, the fastest growing incubator in the U.S. according to the National Business Incubator Association. Saint Louis has a fix for what ails you. Its nationally recognized medical research and academic hospitals, including Barnes-Jewish Hospital and St. Louis Children's Hospital deliver exceptional healthcare to residents and patients throughout the Midwest. Saint Louis is on track to become one of the 10 smartest cities in the U.S. by 2025. It currently ranks as the 14th largest population of adults with college degrees by percentage. Kids in the area can attend one of several nationally ranked K-12 school systems such as Ladue and Kirkwood, as well as numerous higher education options, including Washington University, ranked 14th in the country for its undergraduate program. Saint Louisans take great pride in their community, and rank 8th in nation for volunteering. In 2012, residents contributed approximately 73.2 million hours of service (31.9 hours per resident). Saint Louis is vibrant and diverse, offering unique cultural and entertainment options to visitors and businesses alike, including green spaces like Forest Park – one of only four American parks to make Travel and Leisure's list of the world's 10 most beautiful city parks, three professional sports teams and a variety of retail, restaurants and attractions. The best things in life are free, especially in Saint Louis. Attractions like the city's zoo,science center, art museum and the Missouri History Museum – all conveniently located in Forest Park – are outstanding no-cost destinations. Other free amenities include the City Garden, the World Bird Sanctuary, Grant's Farm – home to the famous Budweiser Clydesdales – and over 100 park and recreation areas. Beyond the blues, Saint Louis offers a wide range of musical tastes from the Saint Louis Symphony Orchestra, the second oldest symphony in the U.S., to contemporary artists playing at the Pageant in the Delmar Loop. From traveling Broadway shows to local repertory theatre and jazz ensembles to dance troupes, a wealth of entertainment options can be found at the Peabody Opera House, Sheldon Concert Hall, Fox Theatre, the Touhill Performing Arts Center or the recently-revived Sun Theater. There's always something on display in Saint Louis. The Saint Louis Art Museum showcases one of the country’s foremost comprehensive art collections, while the Contemporary Art Museum Saint Louis is considered one of the leading voices in the world of modern art. Even the city’s architecture is a sight to behold. Home to the works of many revered architects, St. Louis features the vertical ornamentation of the Wainwright building from Louis Sullivan, the staunchly curved Planetarium from Geo Obata, and Frank Lloyd Wright's organic residential home in Ebsworth Park. 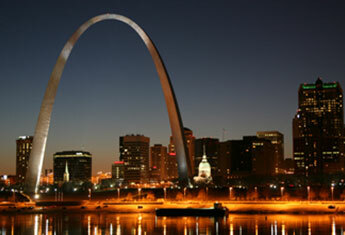 Home to three professional sports teams, Saint Louis is the place for fans of any sport. Visit Busch Stadium to catch some Cardinals baseball, tailgate at The Landing before a Rams football game or check out center ice at the Scottrade Center for Blues hockey. Additionally, a variety of collegiate sports events in the region, including NCAA tournaments and Missouri Valley conference basketball, are game if you are. The one-of-a-kind City Museum will unleash your fun and funky side with a rooftop Ferris wheel, caves and numerous slides. If it's twists and turns you want, head to Six Flags St. Louis, Missouri's Coaster Capital. But for a more chilling experience check out the water slides at Raging Rivers, or take a haunted tour at the historic Lemp Mansion. 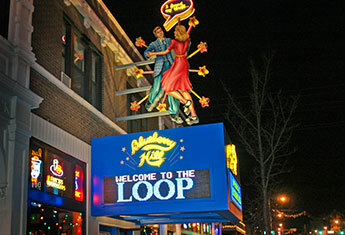 From the nationally recognized streets of Washington Ave. and the Delmar Loop, to upscale and eclectic neighborhoods like the Central West End and The Grove, Saint Louis has something unique at every turn. Downtown is home to the iconic Gateway Arch whose grounds connect its bustling center to the arch and nearby Riverfront Landing. "The Landing," as it's more commonly called, has cobblestone streets chock full of nightclubs, restaurants, a casino and luxury hotels. Three sports venues in area keep the city rooting for the home team, while the Washington Avenue entertainment district is lined with lofts, clubs, specialty shops, and was recently named one of the American Planning Association's "Great Streets." Nearby Soulard is home brick townhomes, taverns, the oldest farmer's market west of the Mississippi, and the Anheuser Busch Brewery. In the city's central corridor, go for a skate at the Steinberg outdoor rink in Forest Park or meander over to the adjacent Central West End to hit trendy shops, pubs and the Cathedral Basilica that houses approximately 41.5 million glass pieces and is considered the largest mosaic collection in the world. Check out the art district at Grand Center filled with theaters, galleries and museums or take a gander at the Victorian-era homes and fine dining in the historic Lafayette Square neighborhood. The Grove is a chic area with bars, nightlight and shops while the Delmar Loop offers a diverse mix of ethnic food, music clubs, and vintage stores. A short trip west on I-64 will bring you to the Clayton neighborhood and business district brimmed with art galleries, boutiques and award-winning restaurants. Crown Candy Kitchen is a gem located just north of downtown where you can fill up on nostalgia, ice cream and candy treats. From here, head out to explore the reemerging Old North Neighborhood and its award-winning community gardens. Also check out the Ville, a historically significant and vibrant African-American community that features Harriet Beecher Stowe College and is where such notable natives as Chuck Berry and Arthur Ashe grew up. A bit farther north is historic old town Florissant, a fun, bustling community. On the south side, catch a traditional game of bocce or visit a corner trattoria, bakery or market in the colorful Italian neighborhood of The Hill. Or, munch on tasty food of all ethnicities along South Grand Avenue, near Tower Grove Park. Find that special collectable in the Cherokee Antique Row historic district or sit down at one of its numerous cafes to take in its artsy and diverse atmosphere. Maplewood is a hip, up-and-coming area featuring eclectic dining and Saratoga Lanes, the oldest bowling alley west of the Mississippi. Don't miss Grants Farm, ranked by Zagat as the seventh-best family attraction nationwide, where kids can feed goats, see where the world famous Budweiser Clydesdales live and more. Just west of the city, kids will love experiencing the Magic House, a fun-filled creative museum, and watching the locomotives come and go from the Kirkwood train station built in 1893. Check out the City of Ballwin, which Money Magazine recently ranked as one of its top 50 "Best Places to Live," Chesterfield, a shopper's paradise with two outlet malls, or Creve Coeur Park’s 320-acre lake, which is a suburban oasis. Just over the Missouri River, Fifth Street in Saint Charles transports visitors back in time via its quaint river heritage. Just across the Mississippi River in Illinois, you can view the world's largest catsup bottle in Collinsville, and in both Millstadt and Belleville, you can pick an apple at one of Eckert's orchards. Or you can climb to the top of the historic Cahokia Mounds, which collectively are the largest structure built by Native Americans north of Mexico. Pull up a chair with a biker or a tourist at Fast Eddie's Bon Air in Alton for cheap eats. If you love things fast, then sprint over to the Gateway Motorsports Park for a drag strip race, or test your luck at Fairmount Park Race track with live horse racing.